Hi, in 2.0.3.5, but also 2.0.3.6 (I reverted back), I get those red, frightening warnings. But in the log I see no warning. Just a lot of stuff. What does Duplicati do here - except frightening me? I deleted+repair DBs, no change. EDIT: I don’t know how to properly post code. Most likely the error is shown in one of the log tables from a database. Since it’s not in the job email my guess is it won’t be in the job log (though you could try looking at the “Remote” tab, just in case I’m wrong). Try using the main menu About link then choose the “Show log” button. It might be under “Stored” but if not check under “Live” and choose the “Error” filter option from the list. Thanks, now I see the messages, but: what is it telling me here? In my recent experience the only time I’ve seen ThreadAbortException errors is when I stop a currently running task such as with ctrl-c with a command line run or “Abort” in the GUI and choosing “now” instead of “after next upload”. I don’t suppose any of those things were happening when you got those errors? I should also point out that a thread abort is usually a fatal error (as in the backup failed) while a warning usually means the backup finished but something unexpected happened such as a file being in use so it couldn’t be backed up. We’d have to dig a bit more but the ParsedResult: Success in your log/email above looks to me like the backup step is finishing just fine but then something else (perhaps a cleanup step) outside of that logging area is having a problem. It happens at every backup. Every time, every backup set. Yes, to my knowledge it creates the backups but still reports those errors. Assuming I’m following the translation correctly, the abort is happening while running SQL as part of the GetBlocksLargerThan() process that basically checks to make sure all your blocks are the same size. However, I would expect a failure in that step to cause the whole backup to fail which isn’t what seems to be happening to you. What is the log entry just before the error? Did you ever get a resolution to this error? I’m having the same issue. 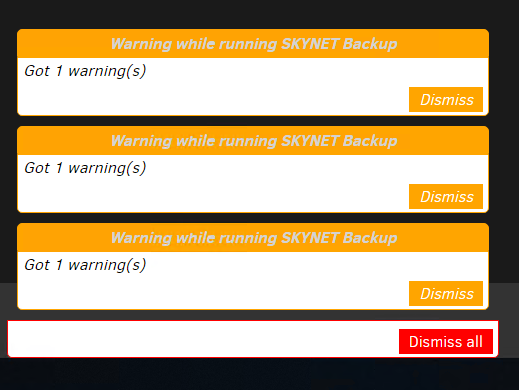 I have 3 backups running on my PC and each one gives me a warning every time it runs. I have that same ThreadAbortException. I to am getting warnings with everything I am doing. My backups seem to be successful however if I try to restore anything I only receive warning after warning but never any explanation. Everything was working so well too and nothing has changed to my knowledge besides Windows Updates. Where are you looking? Duplicati currently (I believe) has warning popups that send one to the job log at Job --> Show log --> General, however the server component of Duplicati (used if you use the browser GUI) can leave messages at About --> Show log --> Stored. If somehow that’s not enough, one can try watching About --> Show log --> Live, or setting up a –log-file. If you can find a warning, please detail it in a new support post. If attempt to do a restore, this is what shows up at the bottom of my screen before I even select the date or files??? I do not see a way to investigate these warnings. I do not see a way to investigate these warnings. Please follow the directions given before. The first sentence is what you tried, but it’s often not sufficient. There are three other ways. The first two need no setting changes, but the --log-file one does, so is last. Viewing the log files of a backup job is what you posted, and probably what the Show button will open up. Viewing the Duplicati Server Logs is because sometimes the server component logs its own messages. This section also mentions the Live button where you can watch in a different browser tab if that’s easier. Adding --log-file option (sometimes along with –log-file-log-level, however warnings log by default) is next.